I first encountered the music of the Latvian composer, Ēriks Ešenvalds in 2011 when I reviewed a disc of his music conducted by Stephen Layton. 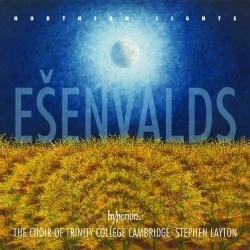 On that occasion Layton was joined by his choir, Polyphony and the Britten Sinfonia; now he explores more of Ešenvalds’ choral music with the help of his Trinity College, Cambridge choir. Two Oxbridge Colleges are closely linked to this programme. One is Trinity College Cambridge, where Ešenvalds was a fellow-Commoner between 2011 and 2013; some of the fruits of that association are included here. The other college is Merton College, Oxford. The composer wrote his Magnificat and Nunc dimittis for their choir and also O Emmanuel, which is one of the seven Great ‘O’ Antiphons for Advent, settings of which by various composers are included in the Merton Choirbook project. The Merton choir has recorded all three of these pieces (review ~ review) and I find it well-nigh impossible to express a preference between the recordings by these two fine choirs. In the canticles both of the doxologies feature an important solo for either soprano or alto. Trinity opt for a soprano – the excellent Hannah King – while Merton take the alto alternative and their male alto is also extremely good. The same male alto sings the prominent solo part in Ešenvalds’ wonderful chant-inspired O Emmanuel. Once again he excels and his haunting timbre suits the music. However, Trinity have a rather special mezzo, Helen Charlston, and her lovely singing tips the balance for me. Among the other religious pieces I was very taken with the short, radiant Ubi caritas, which is a light-textured, flowing piece. In a completely different is the Trinity Te Deum, written for the Installation of a new Master of the College in October 2012. This score includes parts for three each of trumpets and trombones as well as percussion, organ and harp. The opening is exuberantly festive and amid the splendour of the choral sound and the other instruments the harp can be heard adding some telling swirls of sound. Much of the writing is extrovert but an interesting passage for organ leads to a quieter episode at ‘When Thou tookest upon Thee …’ In the following passage the harp is important and female voices dominate the vocal texture as the music gently dances. Interestingly, Ešenvalds doesn’t set the full text of the Te Deum, stopping at the words ‘Make them to be numbered with Thy Saints; in glory everlasting.’ Thereafter there’s a brief, joyful postlude, during which the choir repeats the words ‘Holy, Holy, Holy’ and then the work is over. Even if the setting is truncated it’s still very impressive and the large acoustic of Ely Cathedral adds bloom to the sound. Among the secular pieces, two are inspired by the natural phenomenon that is the Northern Lights. One of them actually carries that title and among its interesting features is a verse of a Latvian folk song which is set as a plangent tenor solo, here sung by the impressive Jamie Roberts. The piece is also remarkable for the use of tuned wine glasses, played by members of the choir. That, apparently, is a favourite Ešenvalds device which is heard elsewhere in the programme. The other Northern Lights-inspired piece is Rivers of light. This didn’t impress me quite as much though it’s unusual in featuring a jaw harp as accompaniment. The tuned wine glasses also feature in Stars, adding a lovely halo of sound. In this setting of words by Sara Teasdale Ešenvalds achieves a remarkable sense of space in his writing, which is entirely appropriate for music that includes phrases such as “a heaven full of stars”. The choral writing is radiant. I enjoyed this disc very much. The music is very well crafted for voices, as one might expect from a composer who has had practical choral experience as a member of the very fine ensemble, State Choir ‘Latvia’. The writing is consistently imaginative and well-tuned to the selected texts. As we have come to expect the Trinity College choir sings exceptionally well. They make a super sound; the balance is consistently excellent and the timbre is appealingly fresh yet there is no want of tonal weight when required. The recording has been made by David Hinitt (engineer) and Adrian Peacock (producer) so it’s little surprise that the sonic results are excellent throughout. Gabriel Jackson’s notes are excellent and written with the understanding of a fellow-composer.